If you're in for a few minutes of interesting, trivial research (or, if you are having a baby and want to do some statistical research on names) you should check out "Name Voyager." 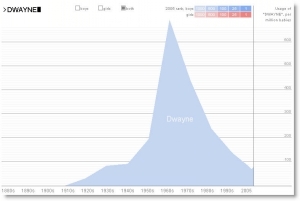 This browser-based app lets you type in a name and it will tell you how popular it's been since the 1880's, whether it was popular as a boy's name, girl's name, or both, and other interesting things. For example, I found out that my name was very popular in the '60's (when I was born) and has had a recent uptick (see the graph). What impact do you think "The Simpsons" has had on the popularity of the name Bart? What about Justin Timberlake's effect on the name Justin? Why has the name Jacob been so popular in the last 5 years? How has the popularity of the name "Gay" changed since the 1880's? Has the name "Jamie" been more popular as a male name or a female name? This doesn't answer any of the mysterious questions of the universe, but it's a fun way to spend a few minutes on the web.